Trust me; it doesn't matter whether you’re a freelancer or a business person with several hundred employees –proper planning and management of your schedules, meetings, projects and work is crucial to run everything efficiently and appropriately. Most of the successful people often use project management platforms to carry out all the tasks with ease and efficiency. You can plan your meetings, track reports and even expenses online and one such platform that I’m going to review AceProject. When selecting a great project management software for our team, we often look for an online tool with a broad range of features, fast and easy to use, and works seamlessly across multiple platforms. Fortunately, AceProject falls under the category and packs all the necessary that a team requires managing their projects. It suits to every type of operations related to planning, management, and scheduling regardless of the project size. Using AceProject for the first time, I strongly felt that the company had kept functionality over looks for the product. A simple, fast and minimal interface makes it easy for anyone to get a hold of all the functions on the platform. Moreover, you have the options to change the theme colors personally. Also, you can customize the dashboard that appears when you first log in to your account. It provides you an overview of all the tasks, last login project, and more. To get started, you can sign-up for a free account. Also, when signing-up, you can choose a custom URL for your account, like “aloukik.aceproject.com”. Great? Isn’t it. With AceProject, you can manage all your projects within a single account and so many features that I can’t even describe. There are places when you feel that the company has made the platform with details, such as tabloid columns, overview projects, or cloud save for multiple people and desktop modification notifications. So without any further talking, let’s dip into the pond of the all the amazing features that this online platform offers. 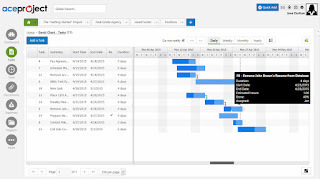 Project management: - The platform packs all the typical project management suite features. It also includes user assignments, task completion tracker, Ganatt charting and much more. Documents management: - Create versions, share files with other team members and even lock all your confidential files in the cloud storage. Timesheet management: - For sales professionals, this feature is a boon for them. With AceProject, you can manage all the real-time client tracking without much effort. Save most of your time and the pain of following each customer personally. Expense management: - Financial Tracking and keeping a track of all your expenses is the one hated thing for every business person and luckily, AceProject excels in tracking all your financial records and reduces the burden. So, now you can focus on other important things. Group Project Management: - Web-based applications are often known for their real-time working features and like any other management systems, AceProject allows multiple users to work on the same project, regardless of time and location. Ease of Access: - For a working employee, every minute counts and to save you a lot of time on sitting over the system, AceProject is available on Mobile Platforms – Android & iOS. You can easily overview all the going on processes and can keep a track of all the scheduled events. 24/7 Support: - Reliable support regarding any issues is available for every customer via email, chats and even call support. The support team is super-friendly and helps as much you need. There are quick tutorial videos and documentations for all the learning to start your managed and tough journey. For starters, you can always opt for the free account which provides you with up to 50 tasks, two projects and five user convenience and 250 Mb storage support. Now, this beastly management platform has flexible price ranges for different users. The standard plan with all the extended features and storage is priced at $19/ month. You can get more information about all the pricing and plans in the image below. Little slow as every feature is available online. Project management, task handling, timesheets, charts, calendars and lots of other amazing features. Honestly, AceProject is one hell of a project management system that makes it far more impressive than other alternatives such as Microsoft Project. Now it is your time to tell me about the software. Give it a try and check if it satisfies your needs efficiently. You can always sign-up for the free account with a custom URL for your account. Get modification alerts via mail and notifications. All in all, a fantastic choice for all the business men and team leaders. Please share your thoughts and opinions in the comment section below. Cheers and Happy Management!